(CNN) -- Andre Greipel has taken control of the Vuelta Espana after he snatched victory in a sprint finish at the end of Thursday's 174km fifth stage from Tarragona to Vinaros. 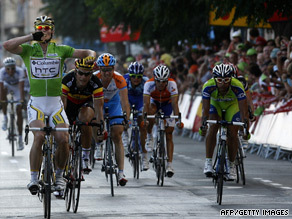 Greipel (left) claims his second sprint victory to take over the race lead in the Vuelta Espana. The German came off the wheel of Tom Boonen to beat the Belgian to the line and open up a six-second advantage over the Quick Step rider at the top of the general classification thanks to his winning time bonus. Previous race leader Fabian Cancellara is now down to fifth position overall, 27 seconds behind. Greipel's victory comes two days after the Team Columbia rider took advantage of a dramatic late pile-up to win stage four -- with Wednesday being a rest day. Thursday's win did not come so easily as Greipel battled Boonen all the way to the line. Philippe Gilbert had earlier broken away and enjoyed a 20-second lead going into the final six kilometers, but he was soon chased down by the peloton, leaving Greipel and Boonen to battle with Daniele Bennati and Tyler Farrar for the stage win. Bennati held the advantage going into the final kilometer but he was caught first by Boonen and then by Greipel, who rounded both men to cross the line first. Bennati took third ahead of Farrar. Bennati and Farrar also hold third and fourth places respectively in the general classification.